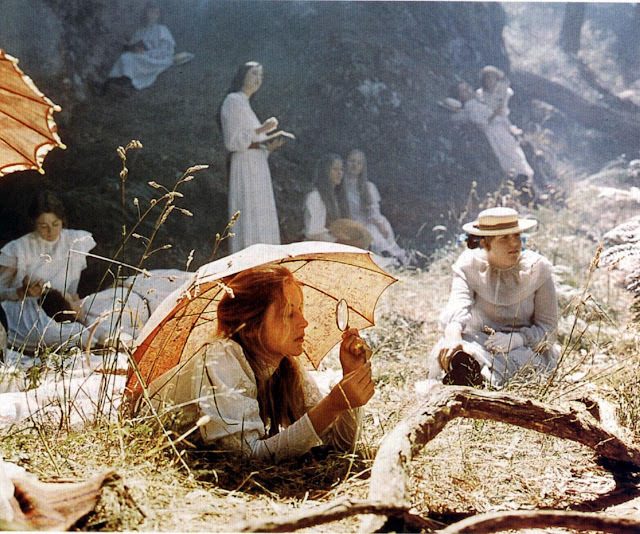 Weir’s Picnic at Hanging Rock, about a group of Victorian schoolgirls who disappear in the Australian Outback, set a standard for ethereal, enigmatic beauty on screen. 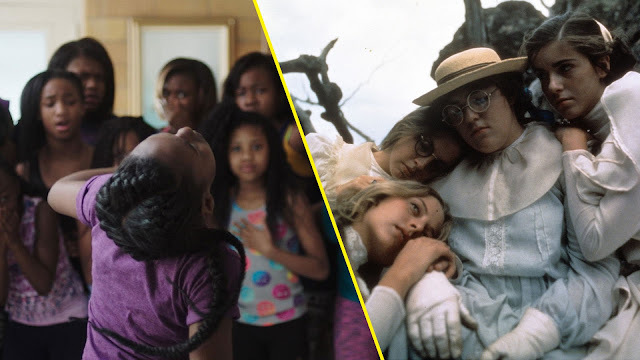 It’s worth emphasizing that a white, male director created this enormously influential representation of white femininity, and that this representation maintains cultural heft to this day, including being ardently embraced by female artists. The aesthetic reverberations of Weir’s film can be seen in the work of director Sofia Coppola whose The Virgin Suicides (1999) owes much to Weir’s softly lit trance, not to mention the film’s fascination with white, blonde femininity. It’s easy to imagine Weir’s camera as an intruder’s gaze watching the mercurial blondes of Hanging Rock like a benevolent scientist examining beautiful butterflies beneath a magnifying glass. 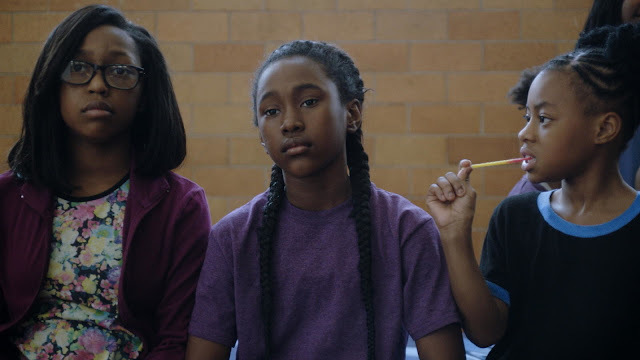 Holmer, a white woman training her camera on an African-American world in The Fits, is an outsider as well, and her gaze could raise alarms about exploitation, appropriation, and authorship. For Holmer, the choice to focus The Fits on a young African-American girl was the fortuitous outcome of wanting to create a film focused on dance and body movement. Holmer auditioned numerous dance troupes before encountering the Q-Kidz drill team from Cincinnati. This meeting led Holmer and her collaborators to mold the film to fit the reality of the Q-Kidz, including setting the film in Cincinnati, and casting a member of the team, Hightower, as Toni. Collaboration is a key word when thinking about the type of filmmaking Holmer proposes with The Fits. It’s a process she shares with contemporary Josephine Decker whose 2018 film Madeline’s Madeline also focuses on dance/body movement and was molded by the casting of its main protagonist, who also happens to be a young woman of color. For these filmmakers collaboration is something that happens between director and subjects as well as director and production team. In interviews about The Fits Holmer downplays her role as director and emphasizes her collaboration with her producer, Lisa Kjerulff, and editor/co-writer, Saela Davis, both women of color, as well as the members of the Q-Kidz drill team. These shout-outs are a true acknowledgement of the many hands involved in making a film, but they might also read as a strategic deflection from accusations of appropriation or unqualified authorship. With both Holmer and Decker there is a strong disinterest in holding the title of director/author/auteur because of auteurism’s inherent hierarchy, which they see as false. Could refusing this title be the key to rethinking the cinematic canon? If the canon has “skewed toward lionizing the white, male auteur” one obvious reason is that demographic feels unapologetically comfortable in the role of auteur and the hierarchy inherent in the title. While the majority of male directors freely discuss the many people they collaborate with on any given film­, that acknowledgment never undermines the fact that they are the director, and as the director they are the sole author of the film. Holmer and Decker’s refusal to carry the crown of authorship could present an alternative to auteurism and the power structures that have dominated filmmaking.